Handknitted collectable meerkats - you name it, I'll knit it! Mmmmmm. Brewing coffee. Eucalyptus. Cinnamon. Chirping birds. A really good violin or piano player. Laughter, especially that of children. Favourite way to spend your time? Creating Pottery. Gardening. Hiking. Reading a good book. Going out to dinner. Sleeping in on a lazy day. Favourite item in your shop of all time? I suppose I'd have to say it is an ivory glazed lidded jar that is covered with teardrops (see below) It sold to a repeat customer last fall. She used it to hold the ashes of a beloved dog that died. I just always thought it was interesting to look at; something you would want to touch. Favourite shop that isn’t yours? I love Gaialai...her beads are so colorful and whimsical. 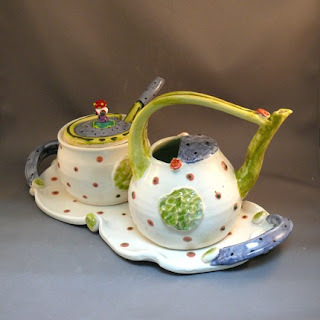 We have traded often; teacups for beads that I use as knobs on my lidded sugar bowls and teapots. And Sari is such a nice person to work with. What has been the most useful lesson you’ve learnt so far that you’d like to pass on to our readers? Communication is key. People cannot hold or touch our pieces and are therefore somewhat nervous about making a purchase from a photograph. So I always acknowledge each order and keep in touch to make sure the piece is exactly what they hoped for. I let them know when it ships and ask them to let me know when it arrives. 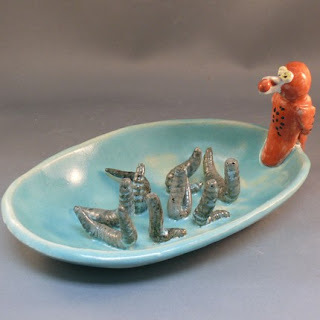 Deb is one of my favorite pottery artists. Just love the range, the style, the sheer joy in her work. Lovely interview. Always been a fan of Deb's work and having the same name awlays helps doesn't it, hehe. 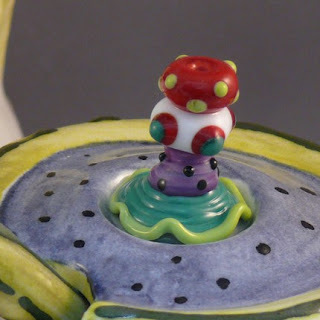 I adore that you are using those fantastic beads as an added whimsical touch to your pottery! Fabulous potter! 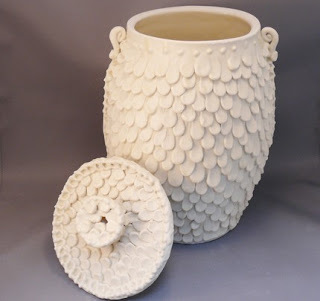 Deb has such variety in her work, from her elegant teardrop vessels to her whimsical pieces, like the worms. Nice interview. 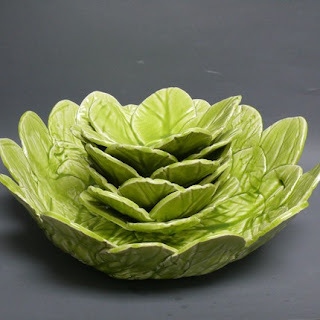 ONe of my favorite sellers and I have a set of her bowls...love them! 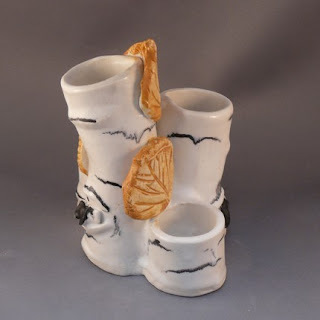 Terrific interview Heather - I love Deb's designs! Meerkats and Flutterbutts like to party! Harry Hill Meerkat in the paper! Meerkat Harry Hill on UK TV! Buzz, buzz, buzz: knitting pattern for buzzy bees! Etsy treasuries - some thoughts on how to be chosen! GIVEAWAY time: Win your own Meerkat Sales Fairy! "I knit, therefore I am."